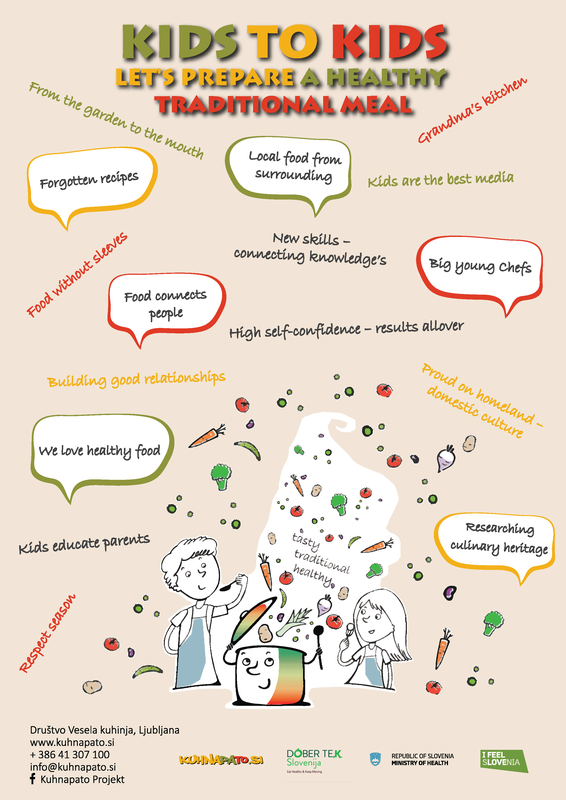 Kids to Kids - Let's prepare a healthy traditional meal! ...also with recognition for marketing work, which has great importance in disseminating information, visibility and loyalty of the entire population. The project is part of the presentation strategy of Slovenia for the Gastronomic Region of Europe, wich will be in 2021. 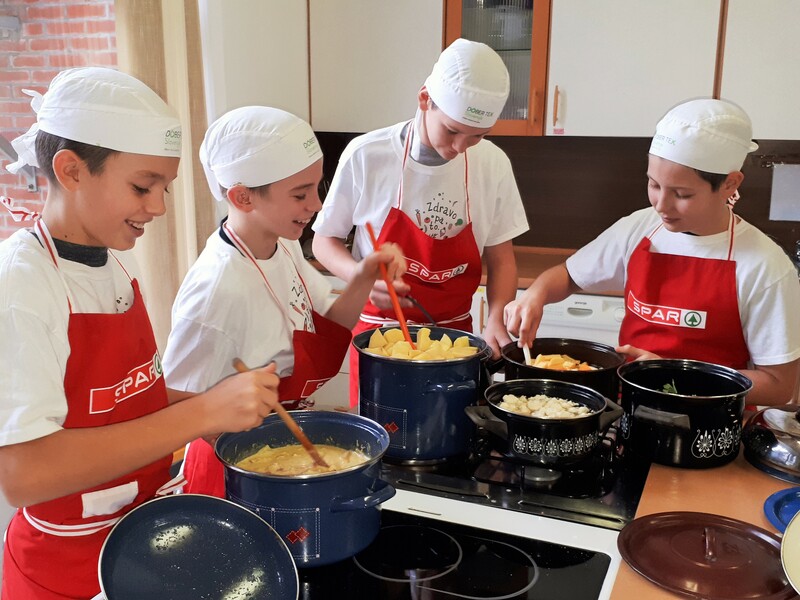 Main task of the kids is to explore the forgotten culinary heritage of their village, town or region - recipes, cooking procedures and their cultural background: when and why dishes were prepared in the time of ancestors and to adopt this dishes to today’s body needs. At the same time, there is a deeper social background, which contributes to long-term health and satisfaction. By participating, kids build better relationships, become more self-confident, and succeed in other fields. The project logically connects the fields of education, health, agriculture, tourism and culture. Get the basic ingredients closer to children as a necessary part of the meal. Make healthy meals "cute" and tasty, thus encouraging the changing of the child's taste. Encourage children to consume large quantities of vegetables and fruits¸ to eat food full of vitamins and minerals to ensure the long-term health. On the basis of tradition, the adaptation of foods to today's body needs: less fat, meat, replace with more vegetables, less sugar and salt. Use locally from the surrounding area – without “traveled many kilometers”. Use seasonally food and to know what, when and why to eat. Knowledge: how to use these things in practice, bring closer to children on an attractive way. Use attractive psychological methods for motivating children. To raise the skills of preparing food at home. To promote joy to work: to achieve better self-image, higher success, better competence of children. With inter-peer stimulus, impact on own and all other generations. Set the children as an example and the best media for disseminating information and knowledges. Create consumers who will require locally produced healthy foods; revive respect and awareness of food produced at home. They are also at the forefront social competences as an essential component of the prosperity of coexistence between diverse groups. Most modern approaches of motivation, where the methodology of transferring knowledge and skills is placed to the forefront: children to children, in a coherent, acceptable way, achieves long-term acceptance by youth. A formal, non-formal learning approach motivates both, children and teachers, who perceive the same kind of advantages and integrate them into the regular learning process. This leads to better learning achievement in general, satisfaction and genuine cooperation between teachers and children, which further enhances the joy of learning and work, self-initiative and friendly level of cooperation in heterogeneous groups, mutual assistance and organizational skills. The content that explores the cultural culinary heritage is the basis for accepting, understanding the cultural background of other groups, strengthening the favorable social environment, cooperation of the local, regional surroundings... It encourages the cooperation of local communities, the support of local communities and the recognition of the regions with its organizations. Updated learning approaches based on modern motivational elements update the entire learning process and give motivation to educate youth outside the school walls. Thus, it gives greater competences to teachers and leads to a permanent desire to upgrade learning approaches according to modern trends. 2015: in cooperation with the Embassy of the Republic of Slovenia in Washington, at a Symposium of Culinary Diplomacy (Make food not war) with the presence of the former Director of the White House Protocol, Patricia Marshall. 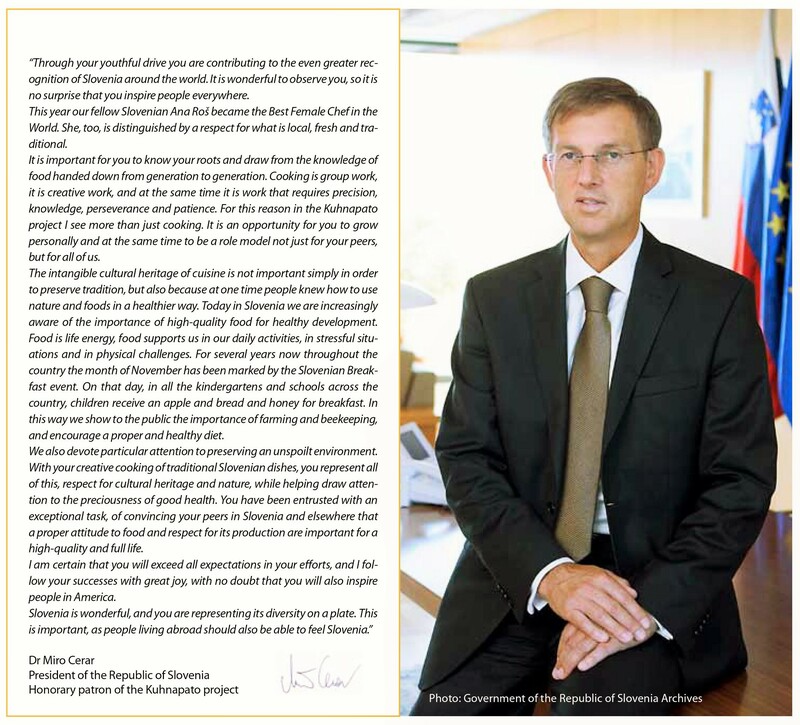 2015: in cooperation with the Permanent Representation of Slovenia to the EU, in order to celebrate the Slovenian National Day, we organized a reception at the Brussels Town Hall for more than 800 diplomats; and for the same reason, in cooperation with the Slovenian Embassy in London, a reception at the Europe House in London. 2016: in cooperation with the Embassy of the Republic of Slovenia in Washington, at the European Union Representation in Washington, with the intention of Slovenia's initiative to become the World Bee Day on May 20, we have prepared traditional honey breakfasts for invited diplomats. 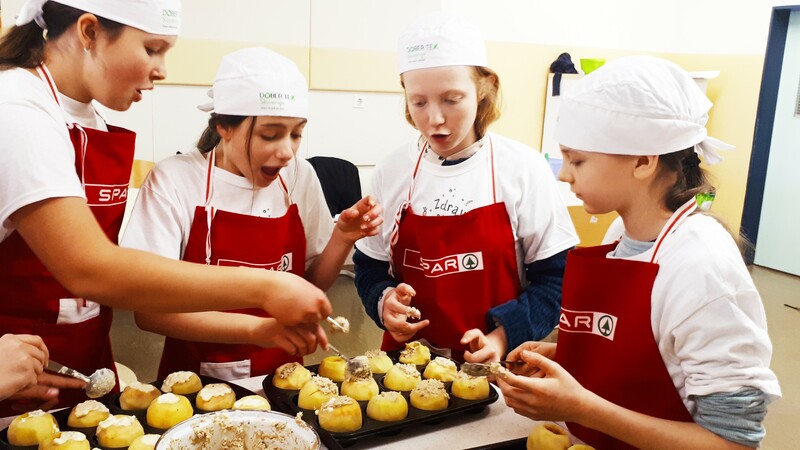 2017: in collaboration with the Embassy of the Republic of Slovenia in Washington, DCPC and DC Central Kitchen, we organized that on 113 Public Schools in Washington (50,000 children) ate Slovene traditional dishes. May 10, the Mayors of Washington DC declared as Slovenian Food Day. This year also the honorary patron of the project was Prime Minister of the Republic of Slovenia, Dr. Miro Cerar. 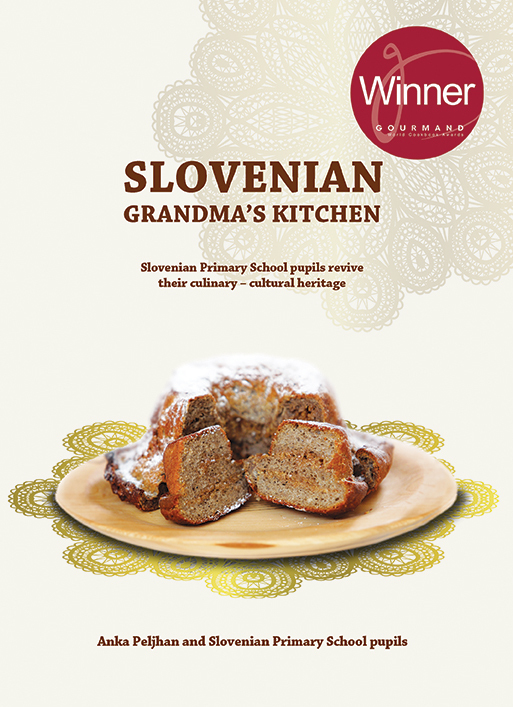 The book Slovenian Grandma’s Kitchen is based on the 8-years rising project of researching culinary/cultural heritage of Slovenia with Primary School pupils. They stepped where ethnologists cannot: into the kitchens of their grandmothers. The book is a collection of the best "food representatives" of all of 24 Slovenian gastronomic regions, with mostly forgotten dishes. 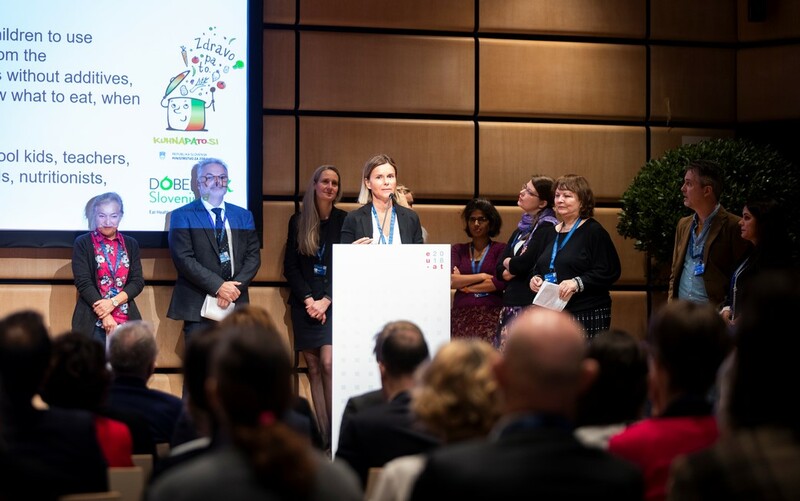 The idea for the book appeared in year 2017, when in cooperation with DC Public School, DC Central Kitchen and with help of Embassy of the Republic of Slovenia in Washington, the Slovenian meals were placed in all 113 Public Schools in Washington DC for 50.000 pupils. 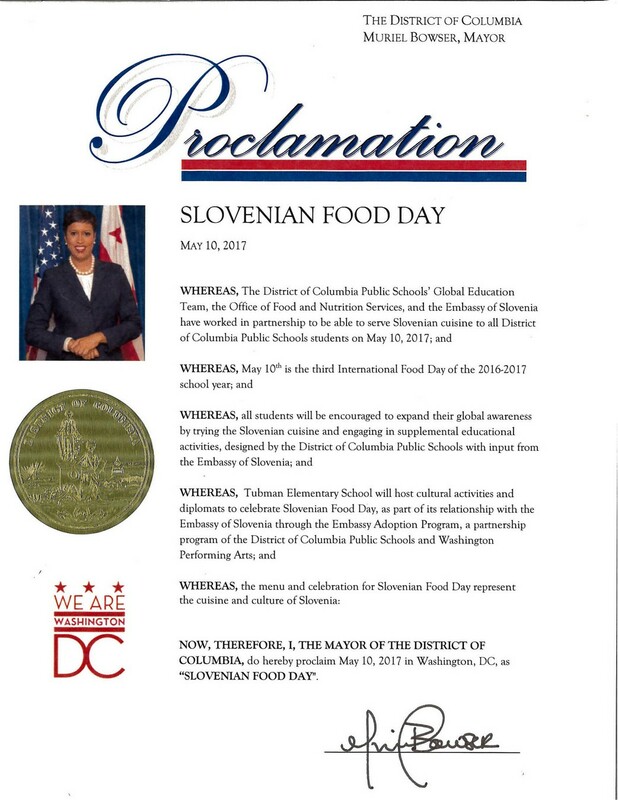 May 10, 2017 declared the Mayor of Washington as a Slovenian Food Day.